1. Preheat the oven to 450 degrees F. Butter and slightly flour four 6 oz. ramekins. Tap out the excess flour. Set the ramekins on a baking sheet. 2. In a double boiler, over simmering water, melt the butter with the chocolate. In a medium bowl, beat the eggs, with the egg yolks, sugar, and salt at a high speed until thickened and pale. 3. Whisk the chocolate until smooth. Quickly fold it into the egg mixture along with the flour. Spoon the batter into the prepared ramekins and bake for 12 minutes, or until the sides of the cakes are firm but the centers are soft. Let the cakes cool in the ramekins for 1 minute, then cover each with an inverted dessert plate. Carefully turn each one over, let stand for 10 seconds and then unmold. Serve immediately. 1. To make the dough, combine flour, sugar, and salt in a processor (if using); pulse 2 – 3 times to combine. 2. Add butter and pulse 4 – 5 times, or until mixture resembles coarse meal. 3. With the processor running, slowing pour the buttermilk through the chute, processing until the dough forms a ball. 4. Remove the dough ball and adhere any remaining pieces of dough to it, then wrap in plastic wrap or parchment paper. 5. Refrigerate for at least 45 minutes before rolling out. 6. Center a rack in the oven and preheat to 350 degrees Fahrenheit. 7. Remove the dough from the refrigerator and place on a sheet of parchment paper. 8. Starting at the center of the dough, roll out, forming a 14-15 inch wide circle. 9. Place the dough with parchment paper on a baking sheet. 10. Brush the bottom of the dough with the apricot preserves. 11. Arrange sliced pears in a spoke pattern on the galette dough, leaving a 2-inch border. 12. Fold the border over the pears, overlapping where necessary and pressing gently to adhere the folds. 13. Lightly brush the edge of the dough with the egg and sprinkle crust and pears with turbinado sugar. 14. Bake the galette for 45 – 50 minutes, or until the pears are tender and the crust is golden brown. 15. Transfer the baking sheet to a wire rack to cool for at least 20 minutes. Serve warm or at room temperature. and grind into a fine powder with a mortar and pestle. ½ bunch cilantro leaves, stems removed. Whisk together the yogurt, lemon juice, turmeric, garam masala and cumin in a large bowl. Put the chicken in, and coat with the marinade. Cover, and refrigerate (for up to a day). In a large pan over medium heat, melt the butter in the oil until it starts to foam. Add the onions, and cook, stirring frequently, until translucent. Add the garlic, ginger and cumin seeds, and cook until the onions start to brown. Add the cinnamon stick, tomatoes, chiles and salt, and cook until the chiles are soft, about 10 minutes. Add the chicken and marinade to the pan, and cook for 5 minutes, then add the chicken stock. Bring the mixture to a boil, then lower the heat and simmer, uncovered, for approximately 30 minutes. Stir in the cream and tomato paste, and simmer until the chicken is cooked through, approximately 10 to 15 minutes. Add the almonds, cook for an additional 5 minutes and remove from the heat. Garnish with the cilantro leaves. 1. place all filling ingredients (except cilantro and beans) on a warm skillet. cook together. 2. add beans. cook another three minutes. 3. warm tortillas, either in a skillet or an oven. 4. pour filling mix down center of tortilla. 5. add cheese, allowing it to melt. Preheat the oven to 450 degrees. Line a baking sheet with foil or parchment and brush with olive oil. Slit the eggplants down the middle, being careful not to cut through the skin. Place on the baking sheet and bake for 20 minutes, until the outer skin begins to shrivel. Remove from the oven and transfer, cut side down, to a colander set in the sink. Allow to drain for 30 minutes. Meanwhile, heat 2 tablespoons of the olive oil over medium heat in a large, lidded skillet and add the onions. Cook, stirring often, until the onions are very tender, 5 to 8 minutes, and add the garlic. Cook, stirring, for 30 seconds to a minute, until fragrant. Remove from the heat and transfer to a bowl. Add the tomatoes, herbs, salt to taste and 1 teaspoon of the sugar and 1 tablespoon of the remaining oil. Turn the eggplants over and place in the pan, cut side up. Season with salt. Fill with the onion and tomato mixture. Mix together the remaining olive oil, the remaining sugar, the water and the lemon juice. Drizzle over and around the eggplants. Cover the pan and place over low heat. Cook gently for 1 to 1 1/2 hours, checking the pan for liquid and basting from time to time with the liquid in the pan, and adding water to the pan if it becomes too dry. By the end of cooking the eggplants should be practically flat and the liquid in the pan slightly caramelized. Spoon this juice over the eggplant. Allow to cool in the pan, and serve at room temperature. Advance preparation: You can roast the eggplant through Step 1 and make the filling through Step 2 several hours before assembling and cooking the imam bayildi. Once cooked, the finished dish can sit for several hours. Combine the vinegar, sugar, salt, and 1/2 cup hot tap water in a container. Add the onion, cover, and let sit for at least an hour at room temperature. Grill the tomatoes, jalapeños, and garlic until blackened on all sides. The jalapeños and garlic will blacken faster than the tomatoes, so keep an eye on them and take them off when they’re done. Set aside to cool. When cool enough to handle, peel the blackened skin off the garlic and discard. If you want a less spicy salsa, de-seed the jalapeños. 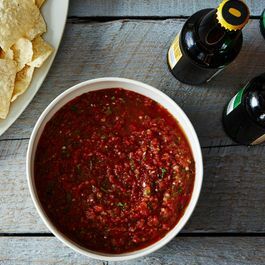 Blend the tomatoes, jalapeños, and garlic in a blender with salt and cilantro. Drain the onion and stir your desired amount into the blended tomato mixture. Finish with a squeeze of lime and salt to taste, if needed.